• Type 1 – Involves the extension of the lower part of the cerebellum (the cerebellar tonsils) into the foramen magnum, which does not involve the brain stem. The spinal cord normally passes through this opening. Type 1 may not cause symptoms and can be acquired, but is the most common form of CM, typically first noticed during adolescence or childhood, and often accidentally noticed during a patient examination for other conditions. • Type 2 – Also called classic CM, Type 2 involves the extension of both cerebellar and brain stem tissues into the foramen magnum. In addition, the nerve tissue that connects the two halves of the cerebellum (the cerebellar vermis) may be only partially complete or absent. Type 2 is usually also accompanied by a myelomeningocele, a form of spina bifida that occurs when the spinal canal and backbone don’t close properly before birth, causing a protrusion through a sac-like opening in the back and resulting in a partial or complete paralysis. Specific to Type 2 is the Arnold-Chari malformation. • Type 3 – This is the most serious form of Chiari Malformations and can cause severe neurological defects. Type 3 is caused when the cerebellum and brain steam protrude, or herniate, through the foramen magnum and into the spinal cord. 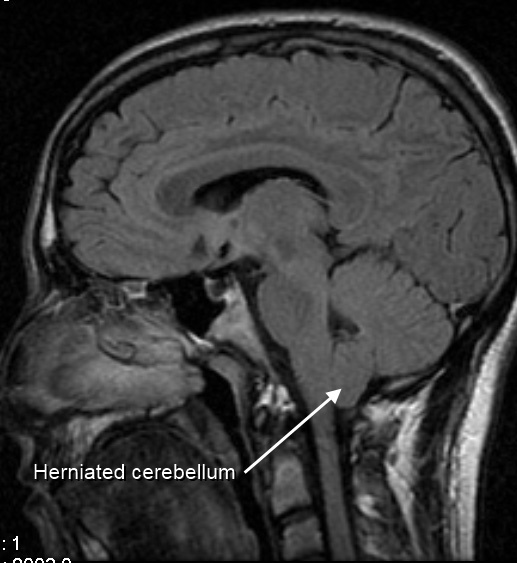 Other Type 3 malformations can be caused when the brain’s fourth ventricle protrudes into the spinal cord and circulates CSF, or when, in rare instances, the herniated cerebellum tissue enters a pouch-like structure protruding out of the back of your head, or when the covering of the brain or spinal cord protrudes through an abnormal opening in your back or skull. • Type 4 – This involves an incomplete or underdeveloped cerebellum, which is a condition called hypoplasia. This is a rare form of Chiari Malformation where the cerebellar tonsils are in their normal position, but parts of the cerebellum are missing. This causes portions of the skull or spinal cord to be visible. • Type 0 – Though under debate by some scientists, Type 0 is caused when headaches and other symptoms are present, but there is no protrusion of the cerebellum through the foramen magnum. Do You Want to Know More About Chiari Malformations classifications? For more information about CMs, read the latest research or call Dr. Laura Sheehan at (415) 681-1031 to make an appointment at our office at 655 Redwood Highway, Suite 160 South Building in Mill Valley or at 915 Irving Street in San Francisco.